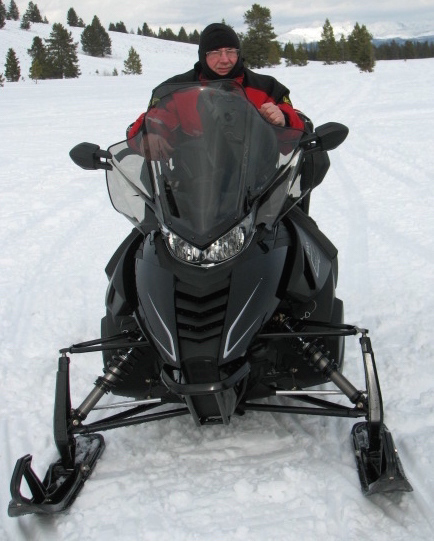 Every sled manufacturer makes a two-up touring model. Yet, these two-up sleds describe the angst that exists in this niche as manufacturers seek to fit the right note between all-out luxury and basic utilitarian frills. We can’t blame the sled makers for their caution and confusion as this two-up market seems to be made up of buyers not sure of what they want. The Quebec-trail rider types want to pack a week’s worth of gear on their sled, leave from near their homes and make a 1,000-mile jaunt with different daily overnight destinations. For them cost is not the major concern. They want long haul reliability, good fuel economy, strong mid-range power and decent top end for the long corridor straights. And, of course, these riders demand storage along with comfort features such as premium gas shock packages, if not on-the-fly air-adjustable suspensions. Ski-Doo has this client nailed. The Ski-Doo Grand Touring with the 1200cc 4-Tec triple ticks all the right boxes on this customer’s order sheet. 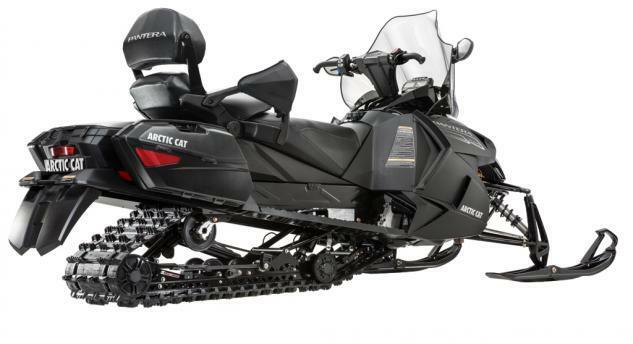 But in 2015 Arctic Cat becomes even more of a player and buying option with its all-new Pantera 7000 LTD.
Arctic Cat’s two-up Pantera is the last Cat model niche to get the benefits of the ProCross platform and Arctic Race Suspension. That’s a bit of a stretch, as the Pantera uses a specially designed platform, loosely based on the ProCross design, that is longer and has a more shallow angle off the snow. Where the ProCross models tend to angle upward from the console area back, the new Pantera chassis tends to be flatter allowing for more on-board room for a passenger and gear. The proven Arctic Race front suspension features coil spring-assisted gas shocks and 6-inch wide trail skis for positive and nimble handling. Being the last of the Cat models to receive the complete makeover, the Pantera more directly benefits from the changeover to four-stroke Yamaha power. Introduced as a new model for 2015, the Pantera catches the 1049cc Yamaha triple in its second season of powering Arctic Cat models and benefits from the learning curve engineering went through to get the wider triple to fit into the ProCross and ProCimb engine bays. This new ProTour platform, while derived from that basic concept, is unique to the two-up Pantera. Its one-piece construction is longer to afford greater portability for passengers and gear. Like the other Pro style chassis, the ProTour was designed to embrace the latest tall spindle Arctic Race Suspension system. For the first time, the Pantera blends the versatility of the elongated chassis with the smooth handling and front-end grip that the ARS ensures. Travel two-up or position the rear backrest for sporty solo riding. 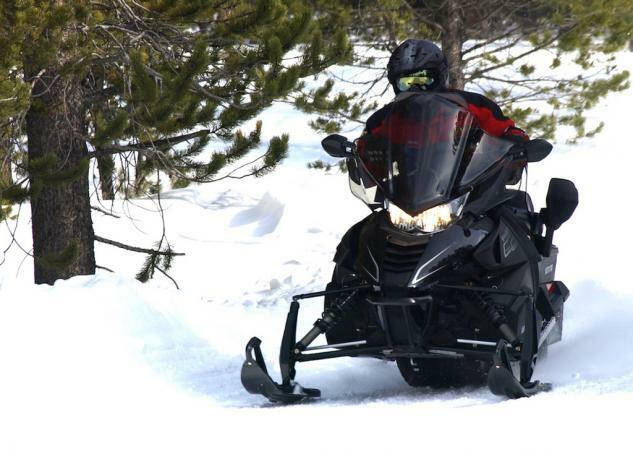 During our test rides, this two-up sled proved enlightening. It felt light, nimble and precise, despite its 127 inches of overall length and 48 inches of width. It wasn’t what we expected. Consider that Yamaha needs electric power steering to wrangle its dedicated two-up models around the bends and switchbacks. The Pantera is very much at home in the twisties. Now, don’t misunderstand, it is not a ProCross ZR 7000, but it is an exceptional handling two-place model and one that serious long haul riders can appreciate. Obviously with that stretched tunnel, Cat engineers built in generous storage, including room for an optional 4.3-US gallon fuel tank. Located behind the rear passenger, this auxiliary tank works with the primary 10.7-US gallon front tank to offer incredible trail range. Keep in mind that one of the Pantera’s benefits is the three-cylinder, four-stroke Yamaha fuel-injected engine that provides up to 135 horsepower, but also provides quiet and economical performance. Combine the 4-stroke economic benefits with the extra fuel capacity and you should be able to go quite a distance before refueling. That’s all good news for serious touring types. 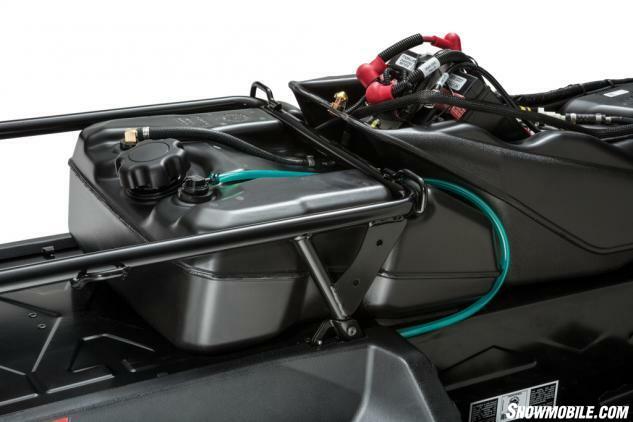 The Pantera’s optional 4.3-gallon auxiliary gas tank combines with a standard 10.7-gallon main tank to provide exceptional on-trail range between gas stops. They will also enjoy the detachable, locking plastic side cases, which can be carried right from your sled into your room at each overnight destination. Plus, the Pantera also adds extra space in the rear storage compartment. If that’s not enough, Arctic Cat has a catalog of touring goodies that range from luggage bags to racks and more. In addition to the sled’s performance, we enjoyed the overall ride quality. The ARS front end with its gas-charged shocks provides up to 10 inches of bump absorbing travel. The elongated Slide-Action rear suspension unit features 13.5 inches of travel using a combination of adjustable torsion springs, gas-shocks and fiberglass overload springs, useful when carrying lots of gear. 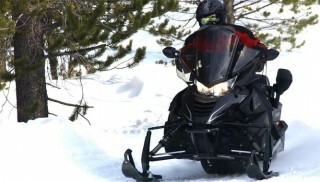 The Pantera, which has been billed as the Catillac of snowmobiles, comes with the expected added touches to include: heated seating, extra tall windshield that works well with the side panel wind deflectors to divert cold winds, fully adjustable handlebar, halogen headlamps, sport bumper and, of course, electric start and push button mechanical reverse. Pantera is all about on-trail comfort with its tall and wide windscreen, sport nose bumper and body panel-mounted wind deflectors. The extra time Cat engineers had in getting the 2015 Pantera to market shows in its all-around versatility. Yes, it can be a straight-up luxury cruiser with good power and a quiet running 15-inch wide by 146-inch long track. Add in lugs with a 1.25-inch profile and you get good bite for corners and excellent straight-line stability. But, the Pantera is also incredibly versatile. The two-up seat is detachable if you need on-board length for any variety of toys and the rear storage area can be converted to suit everything from extra baggage to ice fishing buckets and an auger. Luxury, yes! Versatility, absolutely! When we experienced the Pantera during our test riding sessions, we imagined this platform serving as the next generation of Bearcat-type models. It’s certainly stout enough and, we estimate, its duty as a Bearcat chassis was factored into the original concept right from the start. As a two-up luxury touring sled, the 2015 Pantera has the right combination of must haves along with nice-to-haves to suit serious trail touring types. The Yamaha connection provides a sense of reliable and durable performance crucial to high mileage riders. The Arctic Cat parentage assures riders that it will be sporty and nimble, among the best of it type. The Pantera has a detachable two-up seat and proprietary Slide-Action rear suspension with gas shocks, torsion springs and adjustable fiberglass overload springs. As a serious sled for multi-day journeys, the Pantera is a great choice. It has Yamaha performance, Cat handling, way above average fuel capacity and, thus, excellent on-trail range. 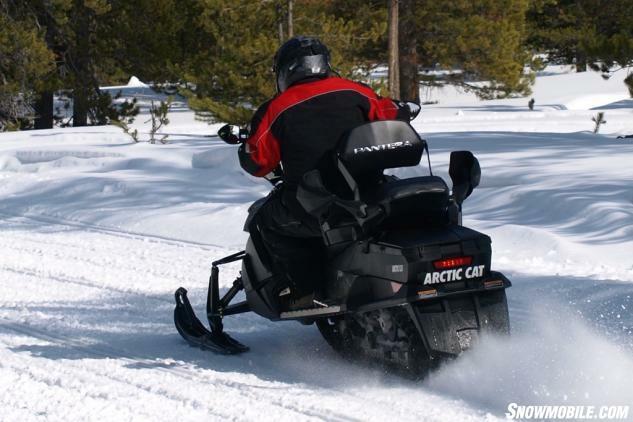 Arctic Cat seems to have gotten the Pantera very right for 2015, especially the fully fitted out Pantera LTD.